When the Pocketbook Ultra leaked in early March I had my doubts as to whether the images were real rather than the product of some designer's daydream, but now it would seem that I was wrong. Details are still scarce on the Pocketbook Ultra, but new leaks have confirm that this ebook reader really exists. Several product listings on German retail websites have turned up online today. They are incomplete, and they still leave many important details unanswered, but it now looks like Pocketbook plans to launch the Ultra by the end of May 2014. 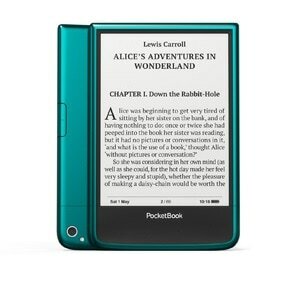 The Pocketbook Ultra has a Carta E-ink screen, making it a rara avis among ebook readers. When it ships it will be only the third device to use that screen, along with the newer Kindle Paperwhite and the recently launched Tolino Vision. The listings also confirm that the Ultra will have a rear facing camera as well as OCR software, which I expect will be supported by a note-taking app of some kind. The Ultra will be available in Green and have a retail price of 199 euros. The listings don't mention the page turn buttons on the rear of the ebook reader, nor do they give the dimensions, weight, or other specs. One listing does indicate that the Ultra will be available by 30 May. 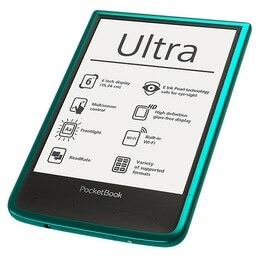 Pocketbook has yet to confirm or deny the Ultra, but at this point I would say that we are looking at their next ebook reader. The Ultra is the most innovative ebook reader design I have seen in several years now, and I can't wait to learn more about it. Stay tuned for the official announcement. Yet another device hard to find in North America.